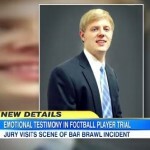 Dan joined the Good Morning America team on Wednesday, June 11th to discuss the ongoing trial of former UNC football player, Kenan Gay. Gay, accused of second-degree murder for dragging a man out of a bar and throwing him in front of a moving car, took the stand during his trial and broke down, delivering an emotional testimony. The 25-year old claimed he never wanted to fight another man but was just trying to protect his then-girlfriend, now wife, from an overly aggressive drunk man. Gay pleaded not guilty and appeared on the stand for over two days of tearful testimony. Says Dan, “He did pretty well, there were some inconsistencies in his account but he doesn’t need to demonstrate to these jurors that he is definitely telling the truth, all he needs to do is convince them that maybe he’s telling the truth or he could be telling the truth because that’s reasonable doubt.” Watch the full clip here.